You know the drill. 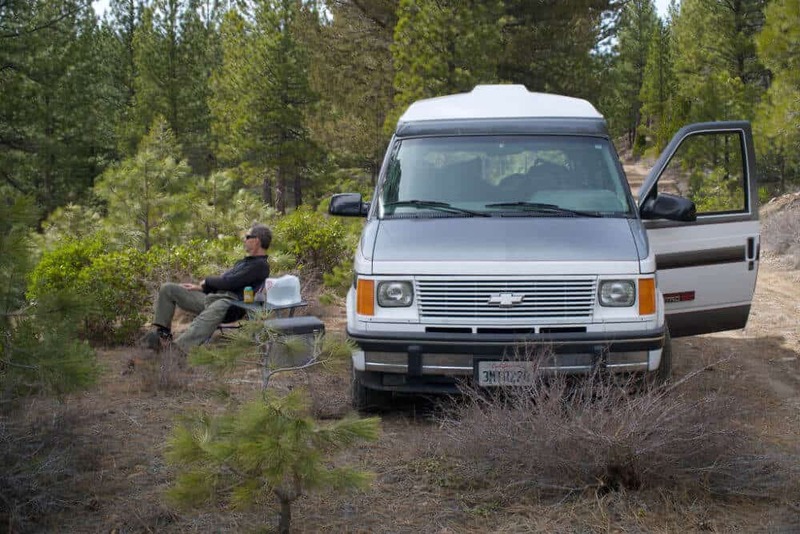 You’re driving in your RV or campervan down a windy, dirt road, trying to find that awesome boondocking campsite. Then, your cellular data goes out. All the bars are gone. Now, you have zero, zilch, nada, right when you needed that signal the most. This has happened to all of us traveling in campervans, RVs and sailboats. I live in a Chevy Astro van and a sailboat and work as a digital nomad, so a good cellular signal is imperative to my success. That’s why I was really excited to learn about something called a cell signal booster. A cell service booster uses a large outdoor antenna to wrangle distant cell signals and bring them straight to your phone or laptop. An RVer I’d interviewed named Amber Baldwin of StoryChasing swears by her WeBoost. She said her phone went from no signal at all to streaming YouTube videos in a matter of minutes. That’s when I knew I needed to try a cell signal booster for myself. WeBoost sent me the 4G-X to try out and review, which is a device meant for people traveling in RVs and vans. I tested the WeBoost cell signal booster, and all opinions in this post are based on my experiences with the WeBoost. So, how does a cell phone signal booster work? If you think about it, the antenna in your cell phone is tiny. That’s why you lose signal so easily and quickly. A cell signal booster uses a much bigger outdoor antenna to capture weak signals and pull them into your rig. Cell phone signal boosters use a three-part system to do this. First, the outdoor antenna is mounted on your vehicle’s roof. It’s usually an omnidirectional antenna that pulls signal from a 360-degree angle. It then sends this signal to an amplifier, also known as a signal repeater, for boosting. Once the signal is boosted using the amplifier, it’s then passed onto an inside antenna inside your RV or van, which rebroadcasts the signal to your phone or laptop. 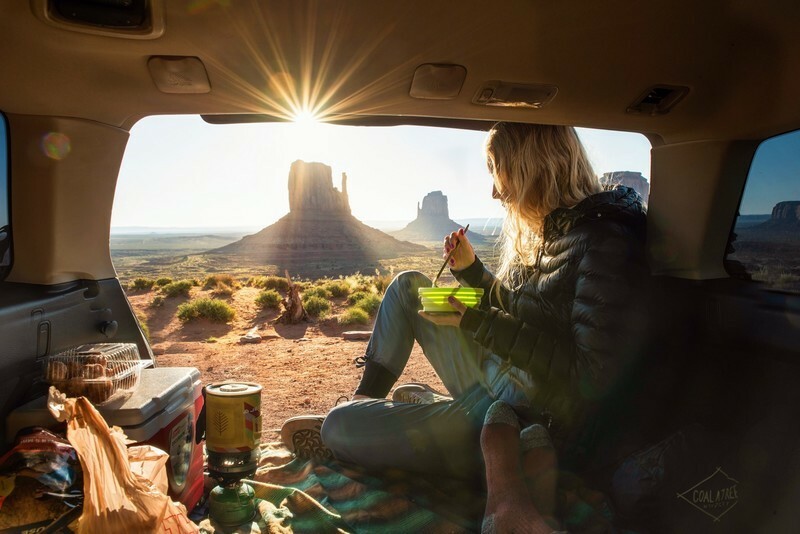 You’ll need to sit fairly close to the inside antenna to reap the rewards of the cell signal booster, but that’s not a problem for people living in vans or RVs. 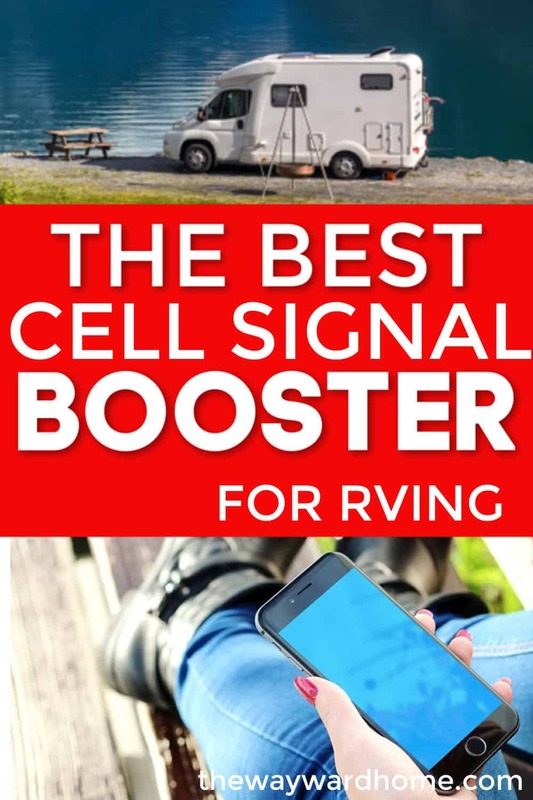 Cell service boosters do work, and they are amazing for people living on the road, or even traveling in sailboats. They are especially important for people who are working remotely. Now that I’ve tried a WeBoost cellular signal booster, I can’t imagine going back. The WeBoost 4G-X comes in a small box with perfectly-labeled interior boxes. Each interior box has the step written on it, so you can easily figure out how to set the cell signal booster up. I usually hate figuring out how to set things up, but it was no problem with the WeBoost 4G-X. Click here to see the WeBoost on Amazon. At first, I was worried I’d have to drill a hole in my campervan’s roof to use the WeBoost 4G-X cell signal booster. The outdoor antenna is usually mounted permanently on the roof of your rig. This is done either using an existing cable exit point, through an RV slide, or by drilling a new hole. I really didn’t want to drill a hole in my van to use the WeBoost, so I improvised. Instead, I just laid the white outdoor antenna on my van’s roof, threaded the cord through the window, and hooked the amplifier up to my 300-watt pure sine wave inverter. The amplifier needs to be plugged into a 120-volt socket or hardwired directly into your vehicle’s 12-volt system. This worked like a charm! I didn’t need to drill any holes. Another option is to buy a magnetic antenna, but my van’s roof is made of fiberglass so that won’t work for me. I’d rate the WeBoost ease of setup as a 10 out of 10. WeBoost sends a simple instruction manual, and I love how each box and component is well-labeled. Anyone, I mean anyone, can set up a WeBoost cell phone signal booster. I first tested out the WeBoost Drive 4G-X at one of my favorite hot springs resort in California that’s notorious for bad cell phone signal. Usually, my phone alternates between one tiny bar and no bars at all. This means I get sporadic cell phone signal, the perfect place to test the WeBoost. I set up the WeBoost, turned it on, and within minutes my cell phone registered a stronger signal! My phone texted, downloaded email and surfed the internet. It even worked as a hotspot linked to my computer, albeit a slow hotspot. But better than nothing! My first attempt at using the WeBoost was an impressive one indeed. I next turned on the WeBoost when boondocking in the Alabama Hills near California’s Sierra Nevada. We both showed zero signal on our Project Fi cell phones. Then, I turned on the WeBoost, linked it to my Verizon hotspot, and was able to download email and surf the internet. My third attempt was in the Tahoe National Forest when my phone showed no signal at all. When I turned on the WeBoost cellular signal booster, I had a couple of bars and LTE signal. One thing to keep in mind is that the WeBoost needs at least some form of cell phone signal in order to work. If you’re in a dead zone with no cell phone towers, it’s not going to magically create a cell phone signal out of thin air. For example, I tried turning on the WeBoost in a dead zone near Death Valley and it didn’t pick up any signal, but I wasn’t surprised. This isn’t the WeBoost’s fault. In the future, I’m excited to permanently mount the WeBoost to our sailboat so we can use it when we cruise around the world. 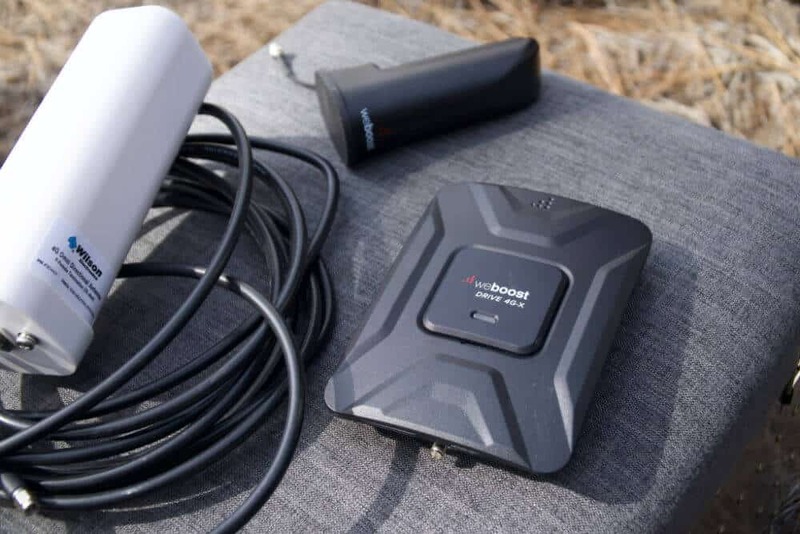 If you’re a digital nomad traveling in a campervan, RV or sailboat, I’d highly recommend the WeBoost cell signal booster. It also helps with keeping in touch with family and friends when you’re in remote places. 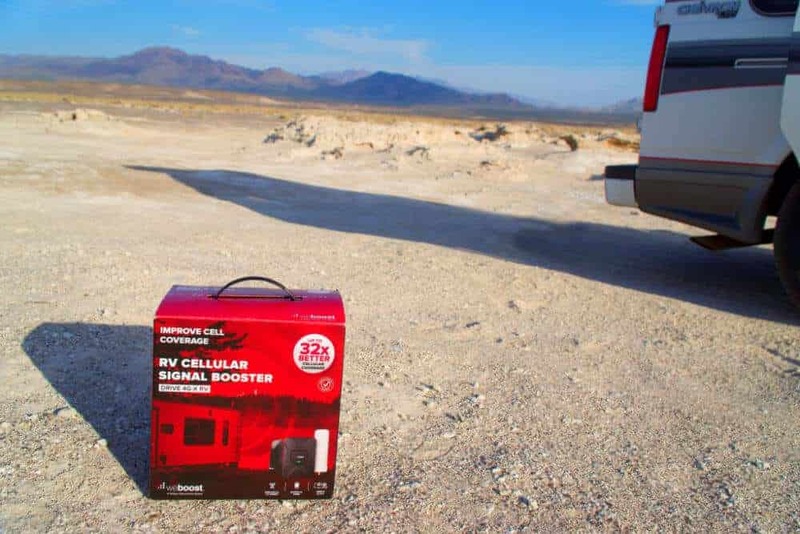 The WeBoost Drive 4G-X RV boosts cell signals up to 32x and enhances cell signal for all passengers in a vehicle – whether it’s a car, truck, van or RV. It’s often used by first-responders who are deep in the wilderness or in places with low cell signal. It’s great for phone calls, texting, emails and surfing the internet. The WeBoost Drive 4G-X RV is easy to install and works really well. You don’t even have to drill a hole if you don’t want to! The only main downside is the price. So far, I’ve been impressed with the level of cell signal boosting and would have a hard time going back to the days without a WeBoost device.